Core funding – funding that covers your child’s functional support needs for daily living and participation, and to access community supports and activities. Capital funding – funding that covers the purchase of one-off items such as equipment, technology or modifications. Capacity funding – funding that supports skill building, training, learning, capacity building, improving health and wellbeing, and support coordination. A ‘stated’ support is a support which must be purchased as described in your child’s NDIS plan, and can’t be swapped for other supports (e.g. Support Coordination). Where a support area in a NDIS plan states “funding may be used flexibly between these supports,” there is some flexibility with how the support area’s funding is used. What if I'm not happy with my child’s plan? When you receive your child’s plan it is important that you review it very carefully to make sure it has all of the support your child needs to meet their goals. If you are not happy with the plan, you can discuss your concerns with your NDIS representative. You can also go through a review process with the NDIS. This process is outlined in your child’s plan cover letter. It is important that you start to use your child’s plan even if you are not 100% happy with it, and then go through the review process at the same time. How do I implement my child’s NDIS plan? After your child’s NDIS planning meeting, there are a number of steps you need to go through before your child can start to use their NDIS supports. Your child’s NDIS plan is underway. 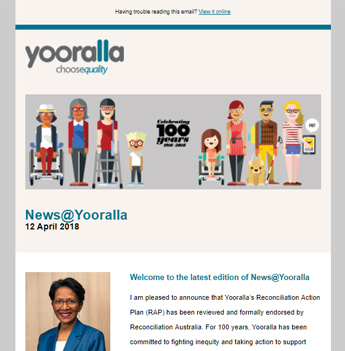 For more information on implementing your child’s NDIS plan, get Yooralla’s free guide to the NDIS for your child. Once you have your child’s plan, and you have set yourself up in the myplace portal, you can start contacting service providers to set up your services. If you want to continue using your existing service provider, you will still need to let your service provider know that you have an approved NDIS plan, so they can set up a Service Agreement for you. The Service Agreement will ensure that the service provider is able to provide your child with supports. Without the Service Agreement, there may not be continuity of service for your child. How do I connect with service providers? A Service Agreement is a contract between you and the service provider, which will outline how they will deliver the supports in your child’s NDIS plan.